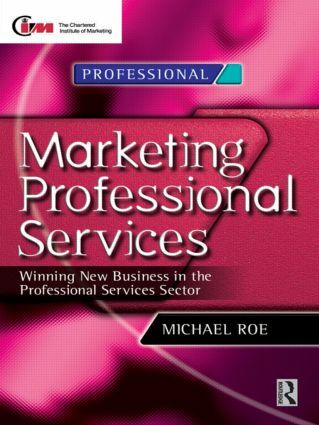 Marketing Professional Services is a uniquely focused, incisive and practical introduction to new business planning, marketing and selling skills for those in the professional services sector. It is for professionals who have to sell to professionals. Individual chapters provide you with a basic grounding in separate sales and marketing issues - from prospecting and cold canvassing to direct marketing and public relations. The book includes sample interactive conversations and provides a constant source of reference for the professional sales person. It is based on long experience of training in this sector and is a short, practical and appropriate introduction to the key concepts. How to use this book; Winning new business; The role of marketing inside your organization; Running a successful new business programme; The elements of business development; Getting there! - Prospecting; Being there! - Cold canvass presenting and pitching; PR; Advertising; Direct marketing; Print material; Keeping the customer happy; A view from the other side; Researching your market; Next steps - putting skills into practice.